Continuing with my March challenge, today I’m to write a six-word story. Silently he spoke his true intentions. Continuing with my March challenge, today I’m to write about my best book haul. The best book haul was at Word on the Street, Halifax, about five years ago. I bought more than 20 books, some for me, some for my kids. The most recent book haul was bought at Dartmouth Book Exchange, Cole Harbour. It’s a wonderful story. If you live near it, visit. Continuing with my March challenge, today I’m to write about what I’m currently reading. Since January 1st, my mind has been preoccupied 80% of the day with events that happened decades ago, leaving me little time to focus on work and the list of tasks to complete the novel I am writing, Mystical Series, book 2, and the one I’m editing, Scattered Stones. This leaves no time for reading for enjoyment. However, I read blogs almost daily, and when I need a five minute break, I pull The Sword of Shannara by Terry Brooks from its spot next to my laptop and read a page or two. 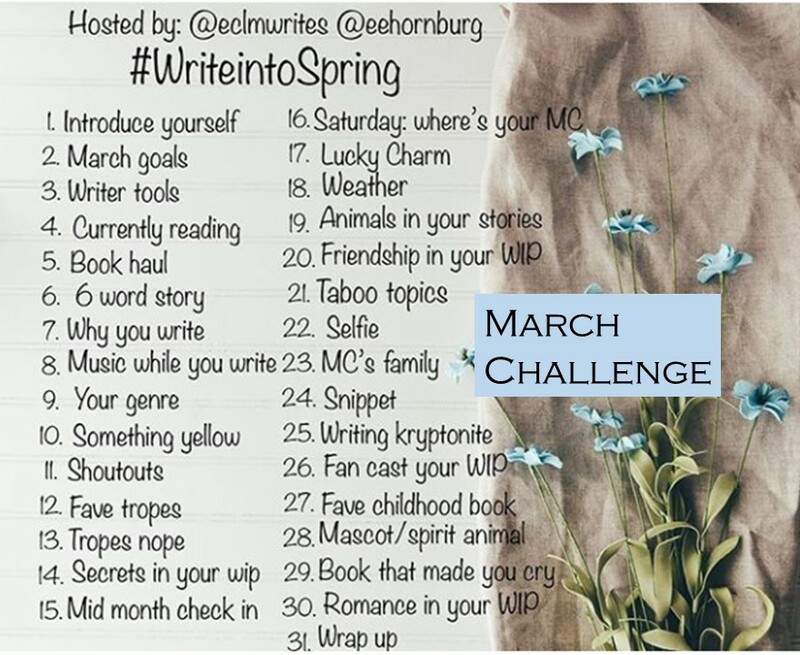 Continuing with my March challenge, today I’m to write about my writing tools. My main writing tool is my laptop. It’s all I really need. Supporting tools include scrap paper, pens, pencils, coloured pencils and various dictionaries. Continuing with my March challenge, today I’m to write about my March Goals. Complete reading the proof for Scattered Stones, book 2 in the Castle Keepers series and release it. Continue to write every day. Currently, I’m writing book 2 in the Mystical series. As of yet, I haven’t found a title for it. Perhaps that will happen this month. I’ve accepted a March Challenge on Instagram, but I’m not on there often, only once-a-month often, so I thought I’d do the challenge here on my blog. The challenge is to write on a particular subject each day. On March 1st, I’m to introduce myself. I’m Diane Lynn McGyver. I’m a fantasy writer. I was a teen in the 80s, so I’m a fan of 80s rock, but I also love country music, Newfoundland music (yes, it’s a thing), Scottish music and Gaelic music. What is my favourite song? That’s a tough one. There are many. At the moment, my favourite slow song is “Heaven” by Bryan Adams. My favourite fast song is “Drinking Again” by Luke Bryan. That’s me on the left in a place that has always felt like home. I can’t remember when I started writing; I’ve always done it. In elementary, I filled Campfire Notebooks with stories. I wrote my first full novel in my late teens by pencil in a coil notebook. I still have it. It was horrible, so I pulled it out about 15 years ago and did major rewrites. Not much of it survived. It turned into Shadows in the Stone, book 1 of the Castle Keepers series. Why do I write fantasy novels? Fantasy contains many elements I admire: magic, swords, sorcery, thieves, honour, castles, horses, dwarfs, hauflins, quests, travel. Anything can happen in a fantasy story, and I get to control it. My books contain many elements and my characters meet many challenges, but the overall theme of all my novels can be boiled down to two things: home and true love. Home has always been special to me, and while I sometimes live where it doesn’t feel like home, I always know where true home is. I don’t want to believe in true love, but my soul mate keeps reminding me he’s there, regardless if we are together or not. Besides writing, my favourite pastime activities are hiking, boating, fishing, camping, playing cards, and hanging out with family and friends just shooting the … breeze. Where would I like to be in ten years? Living near the ocean with my soul mate, writing a little each day and admiring the completed Castle Keepers and Mystical series sitting on my book shelf. Yeah, that sounds like a good destination. Winter, or as they call it in the Land of Ath-o’Lea Forstig and Wintertide, is a rough time to be travelling The Trail. The group wakes up covered in snow on more than one occasion, and the wind whips into their face while they’re riding. While writing a scene, I always have to be aware of the weather. The big question is: Is there snow on the ground? It can change everything.